This featured lot offers a highlight from the Ralph Hutchison Championship ball collection. Items from this spectacular collection were first presented and sold to the golf memorabilia world through The Golf Auction's auctions. This material was met with the highest praise, and aggressive bidding ensued from the most respected private golf collectors in the world along with the renowned museums which display the treasures of this sport. 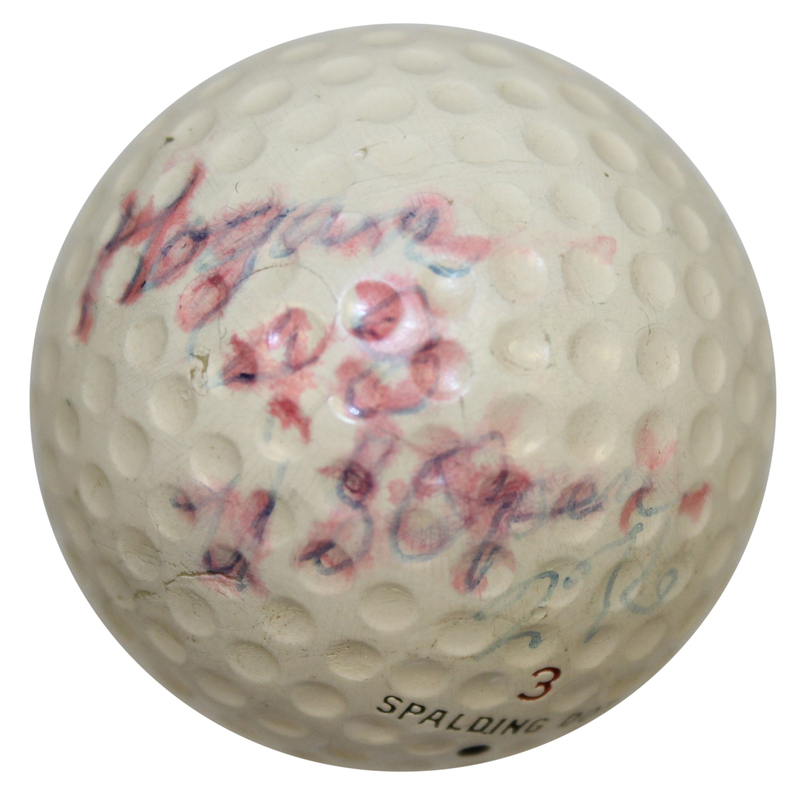 Ben Hogan golf balls used during his Major Championship wins are some of the most cherished golf collectibles that can be found. 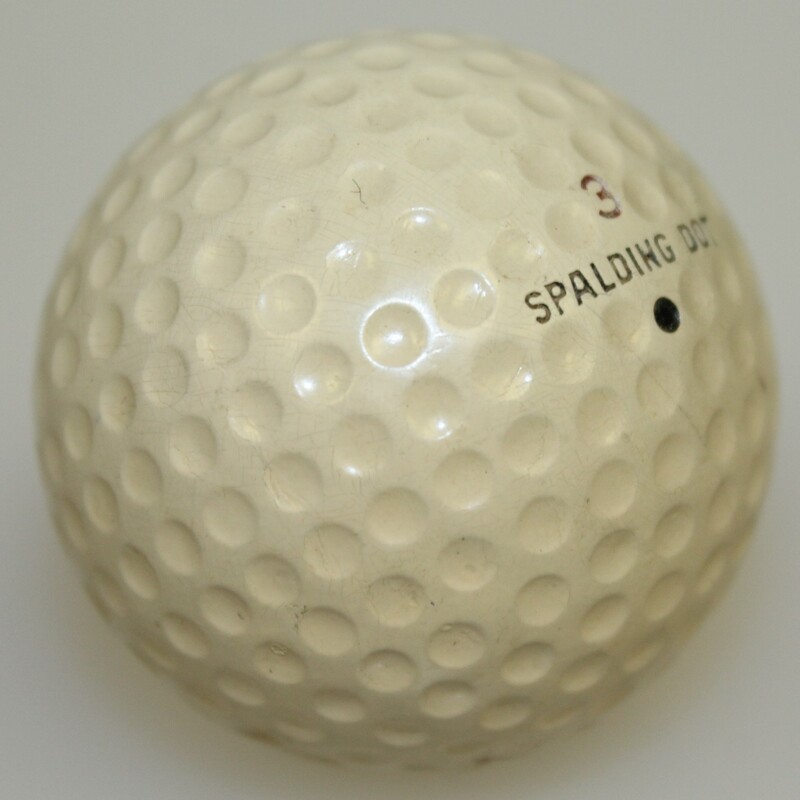 These are so scarce that previously known material can be counted on one hand, including a pair of 1953 British Open used balls obtained by Hogan favored broadcaster John Derr (with one going to the U.S.G.A, and the other retained by Derr). Rounding out the previously known match used golf balls from Hogan Major wins, prior to the stunning find of Hutchison win material, is a 1948 U.S. Open ball which is housed at the U.S.G.A's esteemed museum of golf history (similar to the one offered in this lot). The '48 United States Open was contested at Riviera, and Hogan came through in dramatic fashion shooting an Open record (by 5 shots) score of 276 over the four rounds of his win. Ralph Hutchison was there to congratulate him. Hogan and Hutchison were longtime friends having traveled by car together when both were young twenty something year old starving players breaking onto the PGA Tour in the 1930's (this relationship with Hutchinson was confirmed by Hogan in a 1983 CBS interview and also appears in Curt Sampson's 2001 book "Hogan"). This closeness over the years continued as they both received top club head professional jobs in the PGA's Philadelphia section. With Hogan at Hershey Country Club and Hutchison at Saucon Valley, a scant 81 miles apart from each other. By this time Hutchison had grown accustom to asking the Championship winners for their golf ball(You can read more about Hutchison's role on the 18th green at the Masters 1947-71 and in 15 U.S. Opens in paragraphs below along with Jack Nicklaus' own words from his autobiography about "Hutch" asking him for his 1963 Masters winning ball). 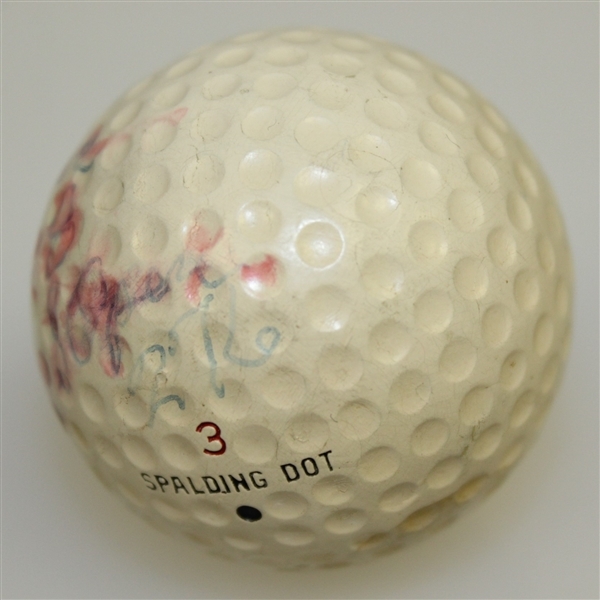 After the final putt had dropped with Hogan claiming his third career major, he gifted his Spalding Dot #3 to his early travel companion and fellow Pennsylvanian club pro Hutchison. (The Spalding Dot brand used by Hogan in his first three U.S. Open wins is further confirmed by his caddy from the '51 U.S. Open Dave Press in a 1996 Associated Press interview "He used Spalding Dot balls ," Press says. "A lot of the pros did. He (Hogan) said when MacGregor made a ball that good, he'd switch". 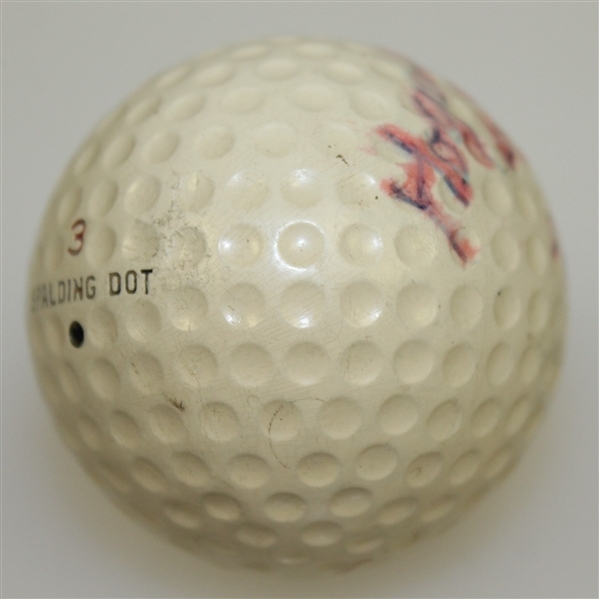 This ball displays consistent use from a round of golf over its surface, and a stain of mounting glue from years of display in "Hutch's" collection. Added to the ball has been the inscription "Hogan" "48" " US Open" "276"(Hogan's U.S. Open record setting score). RALPH HUTCHISON COLLECTION OF CHAMPIONSHIP USED GOLF BALLS--Who is Ralph Hutchison? How did he acquire these historically significant golf balls? Ralph Hutchison, whose great-Uncle was golf Hall of Famer Jock Hutchison grew up in the Oklahoma City area with Jack Grout (the primary instructor of Jack Nicklaus), although Nicklaus would call Hutchison "my second favorite teacher". Hutchison in 1931 became a golf professional and worked under Tommy Armour and Ed Dudley. When Dudley was named the first head professional at the Augusta National Golf Club, he took along Hutchison as his first assistant. "Hutch" held this position from 1932-35 a time period which saw him meet Bobby Jones with the two becoming close friends. So close, that Jones recommended Hutchinson in '35 for the Head Pro's job at Saucon Valley in Bethlehem, PA. He held the position for over 39 years while still competing during his early career with appearances in PGA tournaments primarily in the Winter Tour. During this time period he reunited to travel by car to the various tournament stops with Jack Grout and a third young aspiring pro by the name of Ben Hogan (confirmed by Hogan in one of his few later life TV interviews with CBS in 1983). In 1945, Hutchinson reached the quarter finals of the PGA Championship falling to Claude Harmon. This performance however earned him an invite to play in the 1946 Masters. In 1947, the Augusta National was taking the first steps to better keep fans in the know of play on the course as they installed the first field scoreboards. A conversation from the year before, at the Masters, between Hutchinson and his old friend Bobby Jones led to "Hutch" being positioned at the 18th green as an announcer. As the players approached the 18th Hutchinson would greet them, following up after they putted out with an announcement of what they shot for that day and for the tournament. He carried this position at the Masters through 1971 along with his additional tournament duties on the rules and pairings committees. In addition to the Masters as both player and announcer, Hutchison also combined for this same unique combo at the U.S. Open playing in six events while serving the U.S.G.A. as it's 18th hole announcer at 15 other Open Championships. With all of this major golf experience, and personal relationships with the top players of the game Ralph Hutchison developed a sense for preserving the history of the game. This is bore out in the words of Jack Nicklaus from his 1997 autobiography page 105. Nicklaus describes his 1963 first Masters win, "As I'd walked onto the eighteenth green, the announcer there, Ralph Hutchison, had asked me to save the ball if I won and give it to Bob Jones. When the winning putt dropped, I just had to throw something, so I whipped off my cap and slung it to the crowd. At the ceremony a little later, Mr. Jones and I made an exchange. After he and the previous year's champion Arnold Palmer, had presented me with my green jacket, I gave Bob the ball. It was a small thing, but the look in his eyes remains one of the most emotional memories of my life."